Where to start? “Null” refers to missing data cells in databases. So some of my information, apparently, was not in whatever database the McSally staff was using. (But how did they get me in the first place?) Printing a document with the missing cells flagged as “Null” is a serious amateurish newbie error. And what’s with "McSally for Senate, Inc.? Since when is a candidate committee a corporation? Does the senator have articles of incorporation on file? Back at the beginning of February I posted how McSally runs afoul of campaign finance laws - again. At the time, I thought her problems with campaign finance laws might have been intentional attempts to evade such laws by accepting excess contributions. 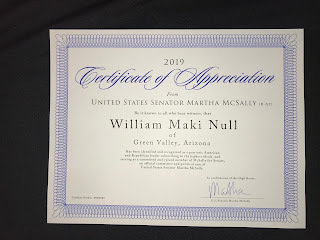 Now, given the mailing I received yesterday, I am more convinced that all McSally’s legal troubles are attributable to rank incompetence and carelessness. Null? Inc? And this was sent to her constituents? Here’s what I will send back to McSally. Best gift? Null. Confirmation receipt? Null. My signature? Null. Credit card number? Nulll. Name as it appears on card? Null. This performance is a clear signal why she does not deserve to be in the U. S. Senate - or any other government post. Vote for McSally? Null. Never.